Jessica Crouch was a single mom working part time and ineligible for coverage through her employer when she became a Toledo/Lucas County CareNet member in 2009. Even when she started getting more hours at the credit union where she worked and qualified for health insurance, she couldn’t afford it. 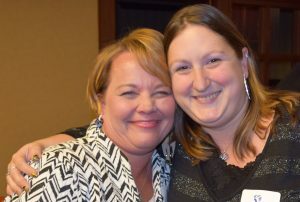 From left, CareNet Assistant Director Julie Grasson helped Jessica Crouch when she was unable to afford health insurance coverage. Jessica had some medical issues – including an ovarian cyst that was believed to be benign – and wanted to make sure her health was taken care of for her family’s sake as much as her own. She is thankful the CareNet charity care network was there for her. Jessica is one of more than 28,000 Lucas County residents who have received access to coordinated healthcare services through CareNet since 2002, when the charity care network was founded. CareNet coordinates primary, hospital and specialty services, which are provided to members for free or at a reduced rate. While a CareNet member from 2009 to 2014, Jessica had surgery to remove the tumor and a hysterectomy to ensure her survival. If she wasn’t a CareNet member, Jessica says, she likely would have put treatment off because she wouldn’t have been able to afford the medical bills. Jessica now has health insurance coverage through her full-time job as a teller supervisor at the credit union, and she regularly sees an oncologist in case cancer is detected somewhere else. In early 2016, CareNet came to the rescue of Jessica’s family once again after her husband’s firm closed and he lost his job after 16 years. Although Kevin started another job as a forklift driver right away, he had to wait 90 days until his insurance coverage began. They met with a CareNet insurance navigator to learn more about marketplace insurance and weigh their options. Although CareNet no longer has navigators since Ohio suddenly lost federal funding in 2017, it does have certified application counselors to help local families with the Health Insurance Marketplace coverage for 2018.